O’Briens Wines imports the Guerrieri Rizzardi wines from the Veneto region of Italy. The family history on their land goes back to 1678 – an incredible journey! The WinePod met up with Giuseppe Rizzardi, owner and winemaker, on his recent visit to the O’Briens Wine School at Donnybrook during which he presented a brilliant Amarone Masterclass. He also gave a comprehensive introduction to each of the wine styles of the Veneto to those O’Briens customers who were lucky enough to buy a ticket. It was sensational value. The podcast recording has all the hustle and bustle of a busy ‘wine school preparation’ in the background! It also has some fascinating insight into some of the finest Amarone wines on sale. This is a genuine Master of the craft welcoming us into his world. Enjoy. Kevin Ecock’s WinePod is brought to us with the assistance of the Santa Rita Wine Room at Monty’s of Kathmandu – a great venue to host your next special event, celebration and meeting. The top middle here is the 2011. All are fascinating. Big differences due to weather and the consequent blend were noticeable. Also, when the DOCG was granted to Amarone in 2010 (banderols (see above) were wrapped onto the bottles) the percentage of Corvina was fixed at a minimum of between 45% and 95%. A percentage of Corvinone up to 50% in substitution to a similar percentage of Corvina is also allowed. This was especially apparent in this tasting where the 2003 had a whopping 49% Rondinella. Other grapes allowed and used by Rizzardi are the Barbera and Sangiovese. 2011: drinking v well. , browning, expressive, earthy, brooding, ripe, balanced. 2009: dark heart, mahogony edges, dull bouquet, broad and fat, fine tannins and spice finish. 2006: Very broad style with big balsam bouquet, aged tertiary elements all the way through, earth and dark tobacco, sweet edges, broad rich styling. 2003: deep seated (not obvious) but very fine bouquet, very tight all the way, very concentrated and ( for me ) hard to warm to. 2001: Exc mohogany, very expressive fruit, attractive wine with dark cherry and tobacco, dry and rich, just a bit short on finish. Top class. 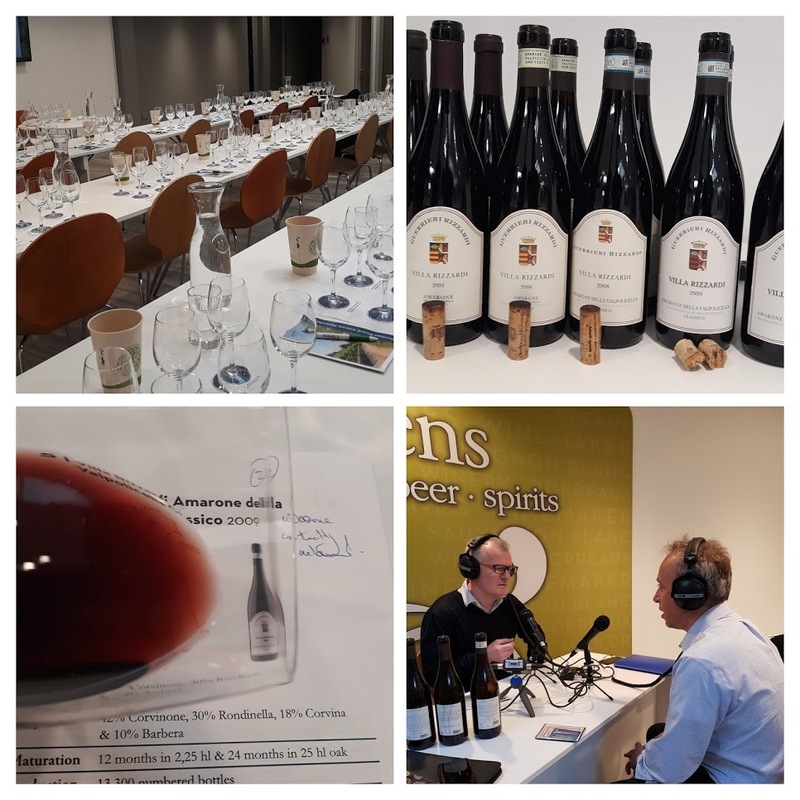 Posted in Consumer Events, Portfolio Tastings, Trade Tastings, Wine, Wine Grapes, Wine People, Wine Podcast, Wine Regions and tagged Amarone, Giuseppe Rizzardi, Italian Wines, O'Briens Wine, O'Briens Wine Festival, Veneto, Villa Rizzardi Amarone. Bookmark the permalink.